Herbert “Skip” Hobson was born in Portland, Maine. Skip’s mom passed away when he was young so he was raised by his step mom Marge and his dad Herbert, Sr. He has two brothers - Daniel and David - and a sister Sherry. For some of Skip’s childhood, he grew up in Dover, New Hampshire, prior to moving to Kittery, Maine, and eventually residing in York, Maine. 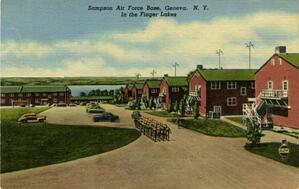 weeks of basic training at Sampson Air Force Base near the Finger Lakes in Geneva, New York. He was sent to school at the Lowry Air Force Base in Denver, Colorado, for training as a “K” system mechanic. Skip received additional training for bomb navigation system repair at March Field Air Force Base in Riverside, California. Skip says “we were referred to as “K” men.” He was honorably discharged from the Air Force on August 20, 1956. Skip received his National Defense Service Medal for his service. Upon his discharge from the military, Skip returned home to York, Maine. He attended Gorham State to receive his GED. His first job was working at Welch’s Texaco Station in Portland, Maine. He later worked for Toledo Scales—calibrating the scales from lab scales to commercial scales. Skip drove dump trucks and worked for various trucking companies through the New England states including American Steel and Alumnimum out of South Portland, Maine. He says, “I must have driven over a million miles.” He retired from driving dump trucks in 2000 from Grondin & Sons in Gorham, Maine. Skip was married to Carolyn until her passing in 2000, and they had five children together—four boys and one girl. He has ten grandchildren and seven great grandchildren. Skip’s hobbies are watching NASCAR, word searches, playing bingo, and painting. Skip came to the Maine Veterans’ Home in South Paris in 2017, and has been a great addition to our MVH South Paris family. Thank You, Skip, for your service to our nation!